In 2015, 193 countries committed to achieving the 17 Sustainable Development Goals (SDGs) of the United Nations. The extent to which that vision becomes a reality will in no small way depend on what is happening in today’s classrooms. Indeed, it is educators who hold the key to ensuring that the SDGs become a real social contract with citizens. Today my discussion is about plastics. The topic is enormous as is the issue for our planet. It’s too big for any one country to tackle and requires a global partnership. There’s plastics and the ocean. Plastic pollution poses a threat to human health, kills and harms marine life, damages and alters habitats, and can have substantial negative impacts on local economies. Check out plastic pollution resources from World Ocean’s Day. Then there’s microplastics. Another useful resource is the UN Environment’s comprehensive six-minute video about the problem, including microplastics, and the role of global partnership efforts can play in the solution. Students could pose questions from a viewing of this video and discuss actions they and their families could take. Could they create a community awareness program for their school? Students might find this challenge from the Ellen Macarthur Foundation an exciting opportunity posed to scientists, designers and other innovators. Perhaps they could look at the award winners and discuss the results. Could they see themselves in the position of the those who took on the challenge? Finally, here’s is a lesson from the World’s Largest Lesson on redesigning plastic packaging. For secondary students, this could be adjusted for younger learners and provides open ended, project based opportunities to enhance global competences towards global citizenship. The links to the Global projects (roll cursor over) are now being added. The projects include a selection fr om by Flat Connections, iEARN, Microsoft Education, Global Education, Deforest Action, Natural Disaster Youth Summit, and Kids Can Make a Difference. Thank you to all these organisations for laying the groundwork for teachers and students to become global citizens by communicating, collaborating, and creating new ideas and concepts using digital technology. I become excited when I read of young global citizens coming up with inovative solutions to a global issue affecting people. Here’s an example fg a positive outcome driven by the inspiration of a student barely out of primary school. HIGHLANDS RANCH, COLO. — In many ways, Gitanjali Rao is a typical 11-year-old: energetic and chatty, with a smile that lights up her face. She can also talk easily about carbon nanotubes, Arduino processors, the reactions between lead acetate and chloride, and how to think through a long-term design process – from concept to experimentation and building. Plus, she’s driven to come up with real solutions to big problems. Last month, Gitanjali earned the top prize at the Discovery Education 3M Young Scientist Challenge. She invented a portable device that can test for lead in water, which she presented to a panel of scientists and school administrators from around the country. The city of Flint, Michigan, has been facing a water emergency because there was too much lead in its water. This story inspired her work. For Gitanjali, coming up with an innovative solution is the reason science is her favorite subject. “Science allows me to look at approaches to solve the real-world problems out there,” she says. Gitanjali focused on water testing as she learned more about the situation in Flint, Michigan. She heard about how limited the options were for people to determine if their water was contaminated. “I hadn’t thought about creating a device until I saw my parents try to test for lead in our water,” Gitanjali says. “I realized it wasn’t a very reliable process, since they were using test strips.” Some strips labeled their water as safe and others showed that lead was present. The more accurate option was both expensive and time-consuming. It involved collecting samples and sending them to be looked at by professionals. “I wanted to do something to change this not only for my parents, but for the residents of Flint and places like Flint around the world,” says Gitanjali. She started with brainstorming. She quickly realized that her initial idea – coming up with a way to remove lead from water, possibly by finding a bacterium that could remove it – wasn’t very practical and might introduce other hazardous chemicals into water. She stumbled onto the idea of carbon nanotube sensors – chemical sensors at the atomic scale – after reading about them on a Massachusetts Institute of Technology (MIT) website. She discovered an article about how useful the sensors are for detecting hazardous gases. When an atom loses or gains an electron, it becomes an ion. This means it has a positive or negative electric charge. These ions are put into the tiny nanotubes with certain gases in them. The ions and the gases then interact, combining together to form compounds, which can be tested. The article got Gitanjali thinking. Why couldn’t she use the same idea to test for lead in water? She started researching carbon nanotubes as well as the properties of lead and what sort of chemical would react with it. She also considered options to receive and transmit the data before settling on an Arduino processor, a programmable computer chip. Gitanjali then moved from brainstorming to experimentation. She decided on lead acetate as the most common compound of lead found in water and chloride as the ion she would introduce to react with the lead acetate. Also, she chose to work with “buckypaper,” a thin sheet made from carbon nanotubes that she could fold and cut. Gitanjali then started making the first model for her project. The result: Tethys, named for the Greek goddess of fresh water. 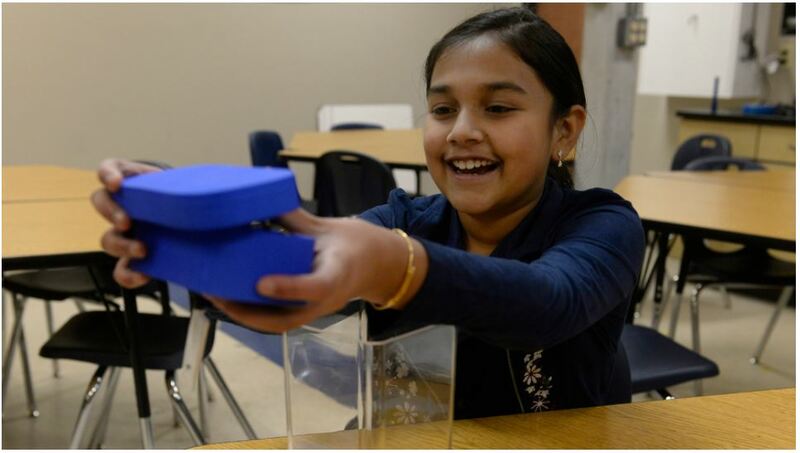 It’s a small blue housing that Gitanjali built using her school’s 3-D printer. It has computer chips and a battery inside, a disposable cartridge that can be dipped in water, and a Bluetooth device that transmits the data to a phone. A free app, which Gitanjali designed with support from her computer science teacher, gives instant results. The process wasn’t always easy, though, and that’s what Gitanjali says she emphasizes most to other children who might want to invent or innovate. Failure is part of the process. “Failure is just another step to success,”she says. In the course of developing Tethys, Gitanjali hit numerous roadblocks. But Shafer, her 3M mentor, helped with developing the device and cutting her presentation down to five minutes, which Gitanjali says was a challenge. Shafer notes that she’s a big fan of competitions like this one, because they make connections between children and working scientists. It allows students to envision what a career could look like and see that scientists aren’t one-dimensional. Along with the honor of winning the competition, which is open to fifth- to eighth-graders, Gitanjali received a check for $25,000, which she plans to use to further develop her device and get production started (her goal is for it to be commercially available within a year). She also wants to donate to the Children’s Kindness Network and save for college. She already has big plans for the future, studying diseases and genetics at the Massachusetts Institute of Technology in Cambridge. Please excuse my excitement as I share something that I’m proud of. The global economy and technology are transforming the Australian economy and society. The work people do is changing and in order to prosper, skills need to be adapted. Our workforce is going global and the global workforce is coming to us. Young Australians need global competencies to live and work all over the world in global teams with global clients. Global Projects help teachers to plan for meaningful deep learning experiences that develop global competencies. They enable the investigation of global events, with many referring to the UN Sustainable Development Goals, answering the call for global citizens who can make a difference in their lives and the lives of others. Global projects allow teachers to incorporate multiple learning areas, teach the Victorian Capabilities in an authentic context and provide opportunities for students to have agency over their learning. These projects have been sourced from across the globe and will shortly be published with alignment to the Victorian Curriculum. The work has been done for you. Keep a watch out! I’ve been reading about education as a tool of democracy and a conduit to connect learners to broader social issues. It made me think about how to learners in their world of sufficiency, could have a better and more empathic understanding of people who live in poverty. What could a lesson look like in the classroom? $1.90 per person per day is the standard adopted by the World Bank and other international organizations to reflect the minimum consumption and income level needed to meet a person’s basic needs. That means that people who fall under that poverty line—that’s 1/8 of the world’s population, or 767 million people—lack the ability to fulfill basic needs, whether it means eating only one bowl of rice a day or forgoing health care when it’s needed most. The purpose of this activity is for students to raise questions and clarify their own thoughts about what things are most important to having a good life. They may also begin to see that although people living in poverty are lacking many material things, their lives may also include some aspects that the students value. This thinking will be important as students learn more about experiences of poverty. Divide students into groups of four or five and give each group a set of cards with the following phrases on them. (They are available to print at the Global Education website ) It is helpful if each card can be printed in a different colour. When the groups have finished, the whole class should look at the continuum. The different coloured cards will help them to notice any trends across the cards from different groups. Students can comment on why they agree or disagree with the placement of particular items. Is there general agreement within the class about particular items? Are there differences between the class’s answers and what they think other people may say about a good life? Do students’ lives actually reflect the things they say are important? Are there any connections between the thinking in this activity and the people/characters in the book or video they viewed previously? Do they think that people living in poverty are able to have a good life? Can students think of anything they have in common with people living in poverty? With thanks to the One World Centre. Resistance art is a form of art that emerged in South Africa in the mid-1970s after the Soweto uprising that focused on resisting apartheid and celebrating African strength and unity. Today Protest or Resistance art has become a broad term that refers to creative works that concern or are produced by activists and social movements. It is a form of non violent, creative expression used against many issues. There are also contemporary and historical works and currents of thought that can be characterized in this way. Have your classroom celebrate International Day of Human Rights through a series of stimulating and interactive activities. This video-conference will explore how the visual arts can be used as a tool to bring awareness to social issues, conflicts and oppression. ….the rise of political parties whose platforms thrive on nationalism, protectionism and xenophobia, strayi further & further away from traditions of tolerance & inclusiveness in democratic societies…. The requirement for global citizenship to be part of the education system is an imperative in a changing world. Our young ones deserve our thoughtful preparation for the issues set up on our watch. Sometimes highly politicised issues need another platform to allow us ordinary folk to digest the nitty gritty, the base elements that affect us all. Coral Bleach, on behalf of the Billionaires United Mining Service, writes for those who know that climate change is real and affects people, not just ordinary people but those in the 1% of the world’s population who garner most of the world’s wealth. I used to be a classroom teacher. My vocation in life became learning and the sharing of that learning. Year after year I searched for every possible way to switch on that love of learning for each learner that sat in my class. In the beginning of my professional journey and fresh out of under graduate studies it was youth, enthusiasm and dogged determination that spurred me on. As the years moved on, the curriculum filled, the administrative duties increased, the accountability sky rocketed and the number of duties outside the face to face teaching time soared. I barely had breathing space, yet alone time to understand the rationale behind the curriculum of the day. I taught through many iterations of my State’s curriculum. Each time, the opportunity to thresh out the direction and implication became more fleeting. The treadmill of pace became faster. I recall the Melbourne Declaration on Education Goals for Young Australians, a manifesto written by politicians in 2008, that promised every child a world-class education was released. The year was 2008. I was on sick leave when the professional development about the Melbourne Declaration took place at my school. In fact, I barely knew about that document at all. The years moved on and my teaching and learning were without its wisdom. Time was too short to educate myself to learn about the world, to smell the roses. After my time in the classroom I became an education officer for a project that opened my eyes and enabled me to learn with other teachers. I looked at curricula from here and across the globe. I learned to use social media and met other educators from around the world, discussed pedagogies, educational development, and future implications. Books and research articles caught my attention and I put myself out there to continue my passion of sharing learning but this time on a global stage. I travelled-to places I never dreamt I would. I’ve seen other cultures, other perspectives to life that in turn have broadened my understanding of what it is to live. I set up a website, simply because I had the time to learn how to do so. My network of educators has expanded to the point that there is always an opportunity to discuss or work at understanding more about learning. And I know all about the Melbourne Declaration. Now I am retired from the classroom but still highly involved in education. I have the time to reflect and review curricula, educational research and directives. I can now connect the dots. I learn every day-about education, the perspectives available and the fascinating stage that is the setting for every engagement we make-our world and its people. And here’s the point. Teachers are time poor. They barely have the chance to get to the bathroom or document on each student. They are saturated in educational material, too much to absorb and implement without the time to do so. That’s if they’re not sick. Their training is also needing review. “Teachers have not been trained to the new requirements. There is a lack of political courage due to a lack of understanding by the general population of the risks of not moving forward. In fact, change is the safest approach.” Charles Fadel, 2017. The attrition rates for new teachers (estimates vary from 25% to 40% within five years) should concern us. (The State of Australia: education, The Conversation, 2014). That’s not a great return on four years of study. Here’s my two bob’s worth. Take a long hard look at how we are educating our students. Our system of teaching land earning has not perceptibly moved on since the models constructed in the industrial revolution. “Today the world of work is changing fast. Jobs are disappearing as automation replaces the need for people and new jobs are emerging that demand transferable skills and capabilities. Schools do not teach for the societal needs at large and employability. This is coupled with narrow assessments focused on traditional knowledge [The 3 Rs] and placing a value on scores – not deep learning.” Charles Fadel, 2107. 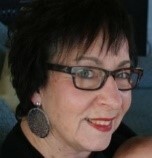 “Research consistently demonstrates that teacher quality is the greatest in-school influence on student engagement and outcomes.” (‘Great Teaching, Inspired Learning: What does the evidence tell us about effective training?’ NSW Department of Education and Communities, Centre for Education Statistics and Evaluation, Office of Education, 2013). Teaching is an isolated profession. I’d factor sabbaticals into a teacher’s years of duty, an opportunity when they can go out into a community, wherever that may be, and just learn for the sake of learning. The experiences will be enriching, will reinvigorate them as educators and reignite their passion to educate others. Investing in educators would have to be a comprehensive insurance for the improvement in quality of education, for the improvement in attitude of students and for the direction our leadership says it wants- to promote equity and excellence in Australian schooling and to have successful learners who are confident and creative individuals – active and informed citizens. 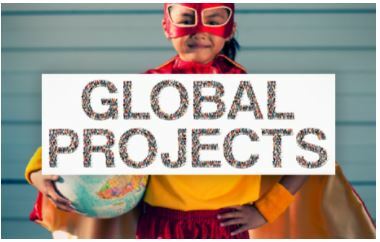 What makes a great global project? As part of Global Leadership Week I’m took my first steps to enter the real time world of connected learning. Now if you’ve hosted a real time chat you’ll know that countdown time is quite a tense one. Is everything in place. Will I sound cool? Will I have followers?